I attended Microsoft Build last month, and bring tales from the future. For Build, an annual conference for software engineers and Web developers, is where Microsoft promotes its products and the tools, techniques, and directions for its third-party ecosystem that have the greatest likelihood of influencing the future. This is especially relevant in the case of Microsoft Teams, given that Teams, unlike Skype for Business, is first and foremost a collaboration solution platform. Three focus areas from Build have implications for the future of Teams: artificial intelligence (AI), mixed reality, and Microsoft Graph. Microsoft seeks to help every developer become an AI developer, thereby democratizing AI. Beyond technology, Microsoft talked about the need for trusted, responsible AI products and practices. To demonstrate this commitment, Microsoft announced a $25 million AI for Accessibility program designed to leverage the power of AI to expand the capabilities of the more than one billion people around the world with disabilities. As Microsoft is known to do, it has introduced a plethora of AI and machine learning products (all under the new Azure brand). These Microsoft AI offerings fall into three broad categories: cognitive services, custom AI, and AI tools. Microsoft wants to deliver widely applicable, pre-trained AI services related to vision, speech, knowledge, language, and search. The mechanism to do so is entitled cognitive services. The idea is to provide all developers an easy way to incorporate intelligent algorithms that help applications, bots, and websites see, hear, speak, and understand. With custom AI services, organizations can experiment with and train deep learning AI models on proprietary datasets, and then deploy the developed models to the cloud and edge. With AI, Microsoft has adopted an open approach, providing deep support for its own cognitive toolkit, CNTK, as well as TensorFlow, Chainer, and other neural network frameworks. Developers can customize and extend almost all of the pre-built cognitive service models to include domain specific identification, translation, and understanding. What this means for Teams: Expect Microsoft to infuse AI everywhere within Teams: automatic transcription for meetings (already available), content summaries, meeting attendee identification, sentiment analysis, auto translation (partially available), voice control via Cortana (partially available), automatic action items and reminders, productivity metrics (e.g. MyAnalytics), attendee engagement analysis, meeting health statistics, and greatly improved search. And then expect third parties to leverage the available AI tools to extend the native capabilities of Teams and provide intelligent bots everywhere! Microsoft uses the term "mixed reality" to describe a spectrum from physical reality to digital reality. This spectrum, as shown below, encompasses augmented reality (AR), provided by devices such as the HoloLens, and completely immersive virtual reality (VR), provided by devices such as the HTC Vive> or Oculus Rift. When I lead vision workshops, I often define collaboration as "two or more people working toward a shared goal that would likely be out of their reach as individuals." 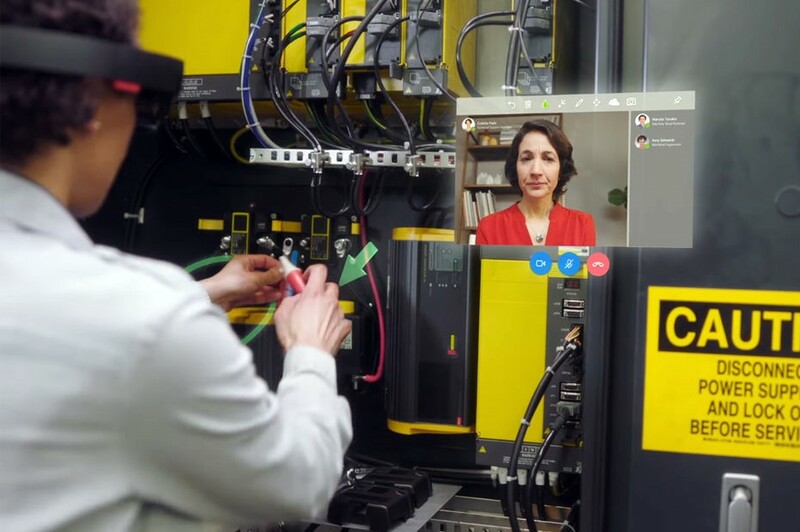 During a Build demo session, using the new Microsoft Remote Assist application and the HoloLens, I was able to repair machinery I had never seen before without any training -- the most direct and immediate example of collaboration I've ever experienced. Remote Assist allows an expert in another location to see what you're seeing, point, and annotate directly in your field of view (because you're wearing a HoloLens). The mixed reality Remote Assist preview application is free from the Microsoft Store as a Teams add-on. A second application, Microsoft Layout, leverages VR and AR to let users design and then validate designs within a specific physical space, such as placement of a new piece of equipment in a manufacturing environment. What this means for Teams: Teams is and will continue to be the hub and proving ground for mixed reality collaboration, even with SharePoint spaces, announced after Build, also delivering mixed reality content.